During the Revolutionary War, the Second Continental Congress acted as the national government of the Thirteen Colonies in rebellion. The Second Continental Congress was composed of many of the same delegates as the First Continental Congress, including the Founding Fathers. The Second Congress managed the colonial war effort, financing the war with borrowed funds and without the support of taxes; states were asked to contribute men, supplies, and funds. With the guidance of Congress, the Patriots moved incrementally towards independence, adopting the United States Declaration of Independence on July 4, 1776. Congress lacked the power to levy taxes and struggled to finance the Revolutionary War. With the ratification of the Articles of Confederation, the Congress became known as the Congress of the Confederation. In June 1775, Congress created the Continental Army and gave command of the Army to George Washington. Benjamin Franklin: A prominent Founding Father and a representative of the United States at the signing of the Peace of Paris. Patriots: In the context of the American Revolution, the colonists who rebelled against British control and declared their independence at the United States of America in July 1776. They are also referred to as Revolutionaries, Continentals, Rebels, or American Whigs. Second Continental Congress: The Second Continental Congress was a convention of delegates from the 13 colonies that started meeting on May 10, 1775, in Philadelphia, Pennsylvania, soon after the American Revolutionary War had begun. Thomas Jefferson: An American Founding Father, the principal author of the Declaration of Independence (1776), and the third President of the United States (1801–1809). The Second Continental Congress was a convention of delegates from the 13 colonies that formed in Philadelphia in May 1775, soon after the launch of the American Revolutionary War. It succeeded the First Continental Congress, which met between September and October of 1774. The First Continental Congress petitioned King George III to repeal the Intolerable Acts (punitive measures passed by Parliament in response to the Boston Tea Party) and initiated a boycott of British goods. The First Congress established that the Second Continental Congress would convene on May 10, 1775. Many of the same 56 delegates present at the First Continental Congress were in attendance at the Second Congress. The delegates reappointed former Continental Congress president, Peyton Randolph, and secretary, Charles Thomson, to reprise their roles at the Second Congress. Randolph was soon called away by other duties and succeeded by John Hancock as president. Other notable members of the Congress included Thomas Jefferson, Benjamin Franklin, and John Adams. By the time the Second Continental Congress met, the American Revolutionary War was already underway. For the first few months of this conflict, the Patriots had carried on their struggle in an ad-hoc and uncoordinated manner. At this point, Congress intervened and assumed leadership of the war effort. On June 14, 1775, Congress voted to create the Continental Army from Boston militia units. Congressman George Washington of Virginia was appointed commanding general of the army. On July 6, 1775, Congress approved a Declaration of Causes outlining the rationale and necessity for taking up arms in the 13 colonies. On July 8, Congress extended the Olive Branch Petition to the British Crown as a final, unsuccessful attempt at reconciliation. The Congress assumed all the functions of a national government, such as appointing ambassadors, signing treaties, raising armies, appointing generals, obtaining loans from Europe, and disbursing funds. In the meantime, the Second Continental Congress tried to lead the new country through the war with borrowed funds and no authority to levy taxes. The Congress relied on money, supplies, and troops from the states to support the war effort; however, individual states frequently ignored requests for support. In September 1777, the Continental Congress was forced to relocate to York, Pennsylvania, as British troops occupied the city of Philadelphia. Declaration of Independence by John Trumbull, 1819: The resolution for independence was among the most important accomplishments of the Second Continental Congress. In 1775, the colonies proposed the Olive Branch Petition to reconcile with Britain and avert war, but King George III denied the petition. The Second Continental Congress, guided by Pennsylvania delegate John Dickinson, swore loyalty to the Crown and requested tax reforms in the Olive Branch Petition. 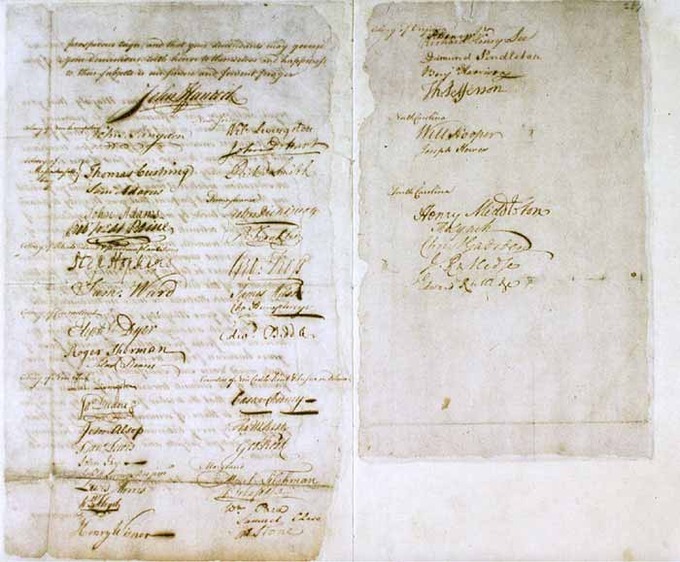 This petition was a final effort by the Congress to avoid war with Great Britain. The Olive Branch Petition vowed allegiance to the Crown and claimed that the colonies did not seek independence—they merely wanted to negotiate trade and tax regulations with Great Britain. The petition asked for one of two alternatives: free trade and taxes equal to those levied on the people in Great Britain, or alternatively, no taxes and strict trade regulations. Dickinson’s petition was not unanimously accepted by Congress. John Adams, leading a smaller faction of delegates, opposed Dickinson; he and his followers viewed war as inevitable. After the Battle of Bunker Hill, in which the British suffered massive casualties, King George III issued a Proclamation for Suppressing Rebellion and Sedition in August 1775. The king’s proclamation declared the 13 colonies to be in a state of revolt. He ordered British officers and loyal subjects to suppress this uprising. The hostility of King George III weakened the colonists’ attachment to Great Britain and strengthened the movement for independence. Olive Branch Petition: Adopted by the Continental Congress in July 1775, in a final attempt to avoid war with Great Britain. Proclamation of Rebellion: Officially titled “A Proclamation for Suppressing Rebellion and Sedition,” was the response of George III of Great Britain to the news of the Battle of Bunker Hill at the outset of the American Revolutionary War. Battle of Bunker Hill: Occurred on June 17, 1775, mostly on and around Breed’s Hill, during the Siege of Boston early in the American Revolutionary War. In the period of uncertainty leading up to the formal declaration of war, the Second Continental Congress attempted to pacify the British and declare allegiance to the Crown, while simultaneously asserting independence and engaging British forces in armed conflict. When the Second Continental Congress convened in May 1775, most delegates supported John Dickinson in his efforts to reconcile with George III of Great Britain. However, a small faction of delegates, led by John Adams, argued that war was inevitable. The Olive Branch Petition was adopted by the Continental Congress in July 1775, in an attempt to avoid a war with Great Britain. The petition vowed allegiance to the Crown and entreated the king to prevent further conflict, claiming that the colonies did not seek independence but merely wanted to negotiate trade and tax regulations with Great Britain. The petition asked for free trade and taxes equal to those levied on the people in Great Britain, or alternatively, no taxes and strict trade regulations. The letter was sent to London on July 8, 1775. The petition was rejected, and in August 1775, A Proclamation for Suppressing Rebellion and Sedition (or the Proclamation of Rebellion ) formally declared that the colonies were in rebellion. The Proclamation of Rebellion was written before the Olive Branch Petition reached the British. When the petition arrived, it was rejected unseen by King George III, and the Second Continental Congress was dismissed as an illegal assembly of rebels. At the same time, the British also confiscated a letter authored by John Adams, which expressed frustration with attempts to make peace with the British. This letter was used as a propaganda tool to demonstrate the insincerity of the Olive Branch Petition. The king’s rejection gave Adams and others who favored revolution the opportunity they needed to push for independence. The rejection of the “olive branch” polarized the issue in the minds of many colonists who realized that from that point forward, the choice was between full independence or full submission to British rule. In August 1775, upon learning of the Battle of Bunker Hill, King George III issued a Proclamation for Suppressing Rebellion and Sedition. This document declared the North American colonies to be in a state of rebellion and ordered British officers and loyal subjects to suppress this uprising. On October 26, 1775, King George III expanded on the Proclamation of Rebellion in his Speech from the Throne at the opening of Parliament. The king insisted that rebellion was being fomented by a “desperate conspiracy” of leaders whose claims of allegiance to him were not genuine. King George indicated that he intended to deal with the crisis with armed force. 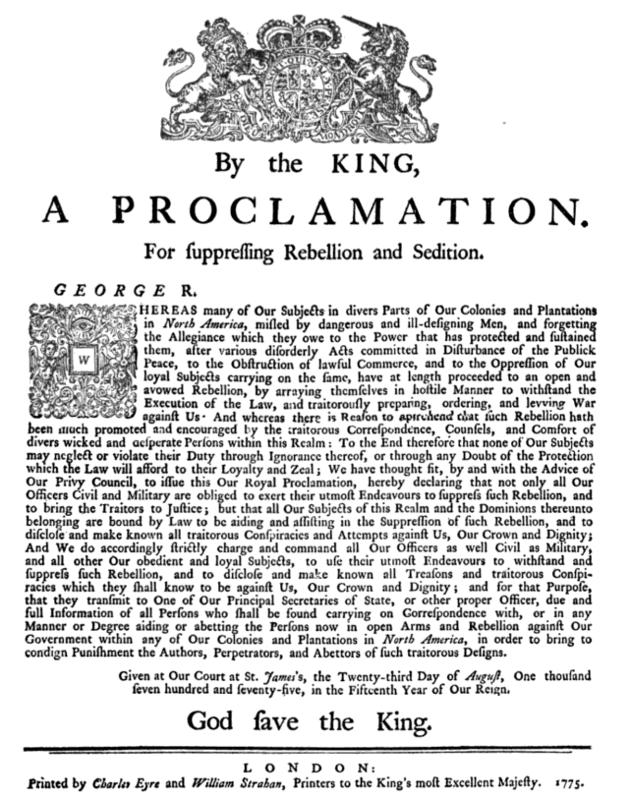 Proclamation of Rebellion, 1775: The Proclamation of Rebellion was King George III’s response to the Olive Branch Petition. Olive Branch Petition, 1775: The Olive Branch Petition, issued by the Second Congress, was a final attempt at reconciliation with the British. In 1776, revolution was fomented by Thomas Paine, who wrote Common Sense; and by Abigail Adams, who advocated for women’s rights. Both individuals influenced the development of the U.S. Declaration of Independence. Common Sense, a pro-revolutionary pamphlet written by Thomas Paine, brought the subject of independence and the ideas of republicanism into public discourse. was widely read in the year of its publication and bolstered enlistment in the Continental Army. Abigail Adams raised questions about the future role for women in the Republic and publicly brought this issue to her husband John Adams during his participation in the Second Continental Congress. Paine donated the royalties from Common Sense to George Washington ‘s Continental Army. Abigail Adams asked John Adams to consider representation for women in the new republic. Common Sense: Common Sense is the title of a pamphlet written by Thomas Paine that was published anonymously at the beginning of the American Revolution, advocating for colonial independence from Great Britain in plain language that made the message accessible to the common people of America. 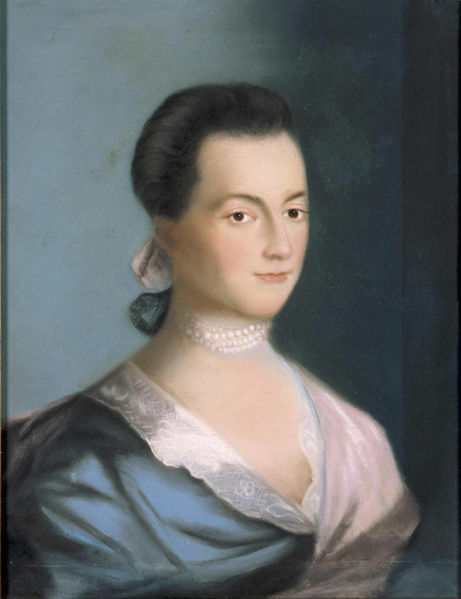 Abigail Adams: The wife of John Adams, the second President of the United States, and the mother of John Quincy Adams, the sixth. coverture: A common law doctrine developed in England during the Middle Ages, whereby a woman’s legal existence upon marriage was subsumed by that of her husband, particularly with regard to ownership of property and protection. Thomas Paine: An English-American political activist, political theorist, and theologian. As the author of two highly influential pamphlets at the start of the American Revolution, he became one of the Founding Fathers of the United States. Republican Motherhood: A 20th-century term for the emerging civic roles played by revolutionary-era women as custodians of the virtues of republicanism. On June 7, 1776, Richard Henry Lee of Virginia presented a three-part resolution to Congress. His motion called upon Congress to declare independence, form foreign alliances, and prepare a plan for colonial confederation. Lee’s resolution was met with debate. Opponents of Lee’s resolution argued that although reconciliation with Great Britain was unlikely, the timing was premature to declare independence and Congress ought to focus on securing foreign aid. Proponents of Lee’s resolution, however, argued that foreign governments were unlikely to grant aid to a party to an internal British struggle, making a formal declaration of independence even more urgent. Moreover, many members of Congress already viewed the 13 colonies as de facto independent, making the declaration a mere formality rather than a revolutionary break from what already had been. The debate remained heated, with some members of Congress threatening to leave should such a resolution be adopted, so the motion was tabled for three weeks. In the meantime, it was decided that a committee should be formed to draft a document announcing and explaining colonial independence should Lee’s resolution eventually be approved. 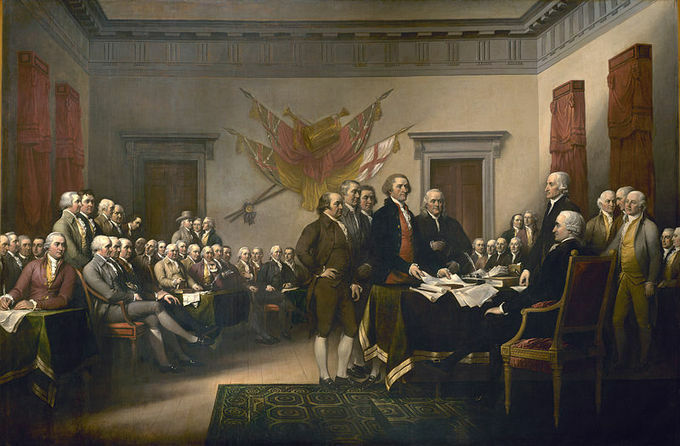 The text of the Declaration of Independence was drafted by a “Committee of Five” appointed by Congress, which consisted of John Adams of Massachusetts, Benjamin Franklin of Pennsylvania, Thomas Jefferson of Virginia, Robert R. Livingston of New York, and Roger Sherman of Connecticut. Jefferson was chosen by the committee as the primary author after a general outline was agreed to amongst the five, and a draft was presented to Congress on June 28, 1776. The official title given to the document was “A Declaration by the Representatives of the United States of America, in General Congress Assembled.” For two days following, the document was edited by Congress, the principal change being a moderation of Jefferson’s claim that Britain had forced slavery in the colonies. Beyond the Second Congress, many colonists shared concerns about British rule and what independence would mean for the future. Thomas Paine and Abigail Adams were two distinct, populist voices upholding the cause of independence during this time. In January 1776, Thomas Paine published a pro-independence pamphlet entitled Common Sense, which became an overnight sensation. This work presented the American colonists with an argument for freedom from British rule at a time when the question of independence was still undecided. To escape governmental censure for its treasonous content, Paine published Common Sense anonymously. The pamphlet sold as many as 120,000 copies in the first three months, 500,000 in the first year, and went through 25 editions in the first year of publication. Paine donated his royalties from Common Sense to George Washington’s Continental Army. Though the themes of the pamphlet were familiar to the elite who comprised Congress and the leadership cadre of the emerging nation, Common Sense was a crucial tool for increasing popular discourse concerning independence. This pamphlet was responsible for broadly disseminating the idea of republicanism, bolstering enthusiasm for separation from Britain, and encouraging recruitment for the Continental Army. Abigail Adams was an advocate for married women’s property rights and greater opportunity for women, particularly in respect to education. Adams was particularly interested in what implications independence from Britain held for women and women’s rights. Abigail Adams, by Benjamin Blythe, 1766: Abigail Adams was greatly concerned about the role of women in the new republic. For the most part, revolutionary-era women’s contributions to politics were limited to the private realm and women were dependent upon male relatives to voice their concerns and opinions in the public realm through a centuries-old practice termed coverture. However, women were also increasingly put in the position of educating future generations in the ways of republicanism during this time. The ” Republican Motherhood” came to encompass the concept that women played a role in instilling civil values and morality in their husbands and children. In this way, Republican Motherhood, though still relegating women’s contributions to the domestic, or private sphere, raised the importance of women’s civic contributions on a national level and encouraged the further education of women. 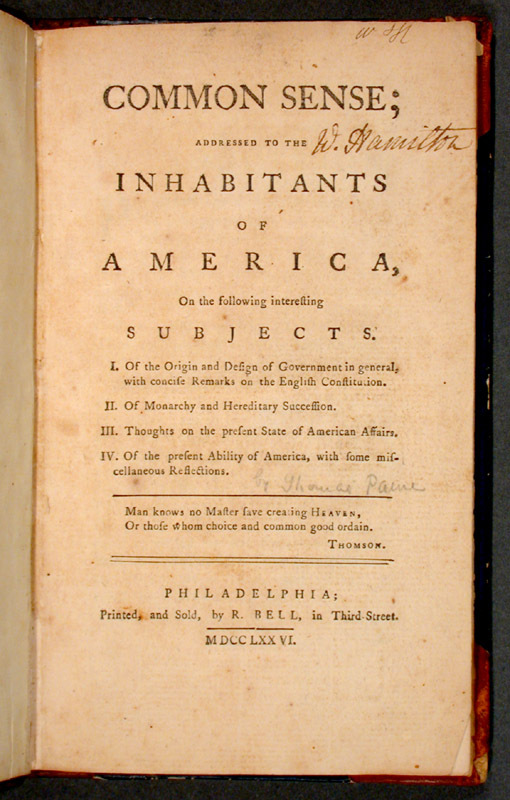 Common Sense, 1776: Thomas Paine’s widely read, 46-page pamphlet effectively argued for independence.